An old manuscript gets a 21st century makeover. Earlier this week Jennifer Alsever wrote a piece for CNN Money called “Guerrilla Marketing for Books.” A cautionary tale for would-be authors, it tells the story of shrinking promotional budgets at traditional publishing houses and the lengths to which authors now must go to get their books to stand out from the ever-increasing numbers of both traditionally and self-published books. The truth is, it has been ever thus – unless you are a big-name author. One tactic mentioned in the story is of an author who commissioned a jewelry artist to make necklaces that are featured on her book’s cover as well as a new perfume based on one of her fictional characters. The amount of work and money involved for an author in doing this is staggering to consider. This, however, reminded me of an event in the provenance of one of my recent ‘new’ books Confessions of a Failed Yuppie. Stick with me for a few minutes! If you’ve been reading Backstory for a few years or even months, you might have realized that the “backstory” I’m trying to tell is the anchor of my own experience in writing and publishing. More than that, though, my objective is to explore the issues that are important to all of us who are more than passingly interested in reading – and writing. Sometimes I rant about things that have annoyed me; sometimes I tell you a story of my experience. Sometimes I tell you a real backstory to my writing: what inspired it, how it developed, what happened next. This post is one of those true backstories. In the early 1990’s I was on a rant about the Yuppie lifestyle. So I decided to write a book about it – but rather than a non-fiction examination of the phenomenon, which would have been more akin to my writing experience at the time, I decided to write a novel – a satire of sorts. I felt strongly, though, that I wanted it published no matter what, so I did what self-publishing authors did at that time, I sent it to a vanity publisher. (For the working definition of a vanity publisher, you might want to surf back to last week’s post: The confusing world of 21st century publishing jargon: A glossary for writers). 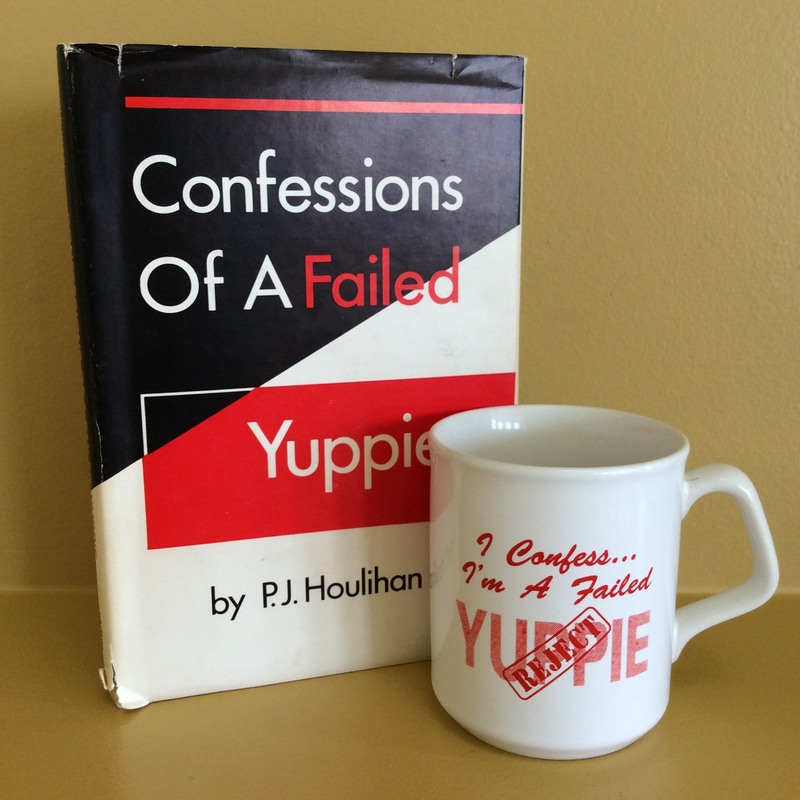 The old Yuppie cover and the mug: “I confess: I’m a failed yuppie” with a “reject” stamp! I created a design for the front of T-shirts and for mugs and had dozens of these pieces of paraphernalia created – all at my own expense, of course – and had them available on the day of the pary. I also had a poster-sized blow-up of the cover of the book so that it could be the focal point of the party, next to the book-shaped cake that adorned the dining room table. I then created a guest list and sent out invitations. As parties go, the event was a great success. We had door prizes of T-shirts that the guests obligingly sported and everyone went home with a signed copy of the book. As the weeks went by, a number of the guests told me that they had enjoyed the book and when was I going to write another one? The book, naturally enough, never sold. Getting a self-published book reviewed in those days was not next to impossible, it was completely impossible. And since there were no social networks available to promote it, short of taking out advertisements at great expense (I did that once) and going door-to-door with a pile of books (which didn’t sit well with my personality), the book would languish with thousands of others. And so it did. Until last year. Writers have lots of finished and unfinished manuscripts hiding on their hard drives or taking up space in filing cabinets. I know that most of us should toss most of it, but sometimes a manuscript draws us back and that’s how I felt about Yuppie. So, I took out the hard-cover copy with its tattered edges and began to write rewrite the book. It’s now a 21st century Yuppie story, and taking advantage of the digital advances, I decided to make it available once again. Acronym for Young Urban Professional, usually occurring in a married pair (often male/female but not necessarily). Categorized as upper middle class or at least moving in that direction, ambitious, well-educated. Characterized by excessive concerns about appearances. Lightly narcissistic. May have money or at least leverage. But not necessarily. Normal habitat is the urban condo, sometimes the single-family dwelling of dubious heritage in a downtown area with a postage stamp for a yard, for which a bidding war took place prior to acquisition. Yuppies with children often move to larger, more impressive dwellings. Diet consists mainly of cocktails, organic kale and the latest gastronomic fad. Would not be caught dead in a North-American-produced automobile brand. Skis in winter, does hot yoga, plays squash (it’s making a come-back), and quietly brags all year round. Widely thought to have become extinct in the early 1990’s. Not so much. Maybe you’d like to read the rest. Or not. Let me first say that I thoroughly enjoy your posts. They are on point and very informative. Now for my rant. As an unpublished writer, I identified strongly with this post. The silliness involved in finally getting a book published is astounding. T-shirts, coffee mugs, humbug! When I was a young man, I promised myself I would someday write a novel. Now I have written two, one good and one not-so-good (the first — to be rewritten), but as an older man who does not need to make money from my writing, I do not know if I am willing to do what is necessary to obtain representation or to self-publish. I would like to see my work in print, but the whole world of publishing seems so phony that it’s hard to stand the stink of it. Thanks so much for the comment and I’m happy that my posts resonate with you. I, too, am at that stage where I do not need the money to validate my work — and yes, I too can be self-critical enough to know when my work is good — and when it’s not. Sadly that’s not the case with all of the self-published authors out there. That being said, there is something about seeing that book in print that seems to imply that this part of the journey is over. I, too, struggle with the phoniness inherent in the publishing world, whether it’s agents who think they know what will sell (they don’t) to publishers who think online platform is the be all and end all (it isn’t since most wannabe writers are connected not to readers, but to other wannabe writers). In any case, I wish you well in your writing whether you decide to publish or not. do come back! Thanks for the good wishes, Patricia. I guess all of us want to leave something behind so the world will know we were here — that’s the validation that comes with having a work published. If you have a chance, visit me at highdesertlit.com. I will be back!